(8108, Oklahoma Historical Society Photograph Collection, OHS). One-eighth Osage, Clarence Leonard Tinker was the first American Indian in U.S. Army history to attain the rank of major general. He was born on November 21, 1887, in Osage County, Oklahoma, the former Osage Nation, Indian Territory. Tinker, the eldest son of George E. Tinker and Sarah A. Schwagerte, received his elementary education in Catholic institutions at Hominy and Pawhuska, Oklahoma, and the Elgin, Kansas, public school. Beginning in 1900 he attended the Haskell Institute at Lawrence, Kansas, but withdrew before graduating. In fall 1906 he enrolled in Wentworth Military Academy at Lexington, Missouri. Graduating in 1908, he was commissioned a third lieutenant in the Philippine Constabulary. Tinker's service with the constabulary lasted until 1912 when he was commissioned into the U.S. Army as a second lieutenant. After infantry training he joined the Twenty-fifth Infantry Division at Fort George Wright in Spokane, Washington. In January 1913 the Twenty-fifth transferred to Hawaii. While stationed near Honolulu, Tinker met and married Madeline Doyle of Halifax, Nova Scotia. During World War I Tinker served in the southwestern United States and California, rising in rank to major. In 1919 he began flying lessons and soon transferred to the Air Corps. Tinker's aviation career began when he was assigned to flight duty on July 1, 1922. For the next twenty years he was stationed primarily at air installations in the southeastern United States. He continued climbing in rank, becoming a brigadier general on October 1, 1940. At that time he was in charge of MacDill Field, Tampa, Florida. As German armies rolled across Europe, he cautioned against Japanese aggression in the Pacific. The plans he devised to protect the Panama Canal and Caribbean region became important wartime strategy. Tinker took command of the Hawaiian Department following the Japanese attack on Pearl Harbor in December 1941. Promoted to major general in early 1942, he was placed in charge of the newly created Seventh Air Force at Hickam Field, Hawaii. A proponent of aggressive bombing tactics, Tinker led four Liberator bombers on a raid to Wake Island on June 5, 1942. Leaving Midway Island on June 6, his plane crashed at sea, killing all on board. Clarence L. Tinker was the first American general to die in World War II; his body was never recovered. He received the Soldier's Medal in 1931 and, posthumously, the Distinguished Service Medal. Tinker Air Force Base in Oklahoma City, Oklahoma, is named in his honor. James L. Crowder, Jr., "Osage Aviator: The Life and Career of Major General Clarence L. Tinker," The Chronicles of Oklahoma 65 (Winter 1987–88). James L. Crowder, Jr., Osage General: Major General Clarence L. Tinker ([Midwest City, Okla.]: Oklahoma City Air Logistics Center, Tinker Air Force Base, 1987). 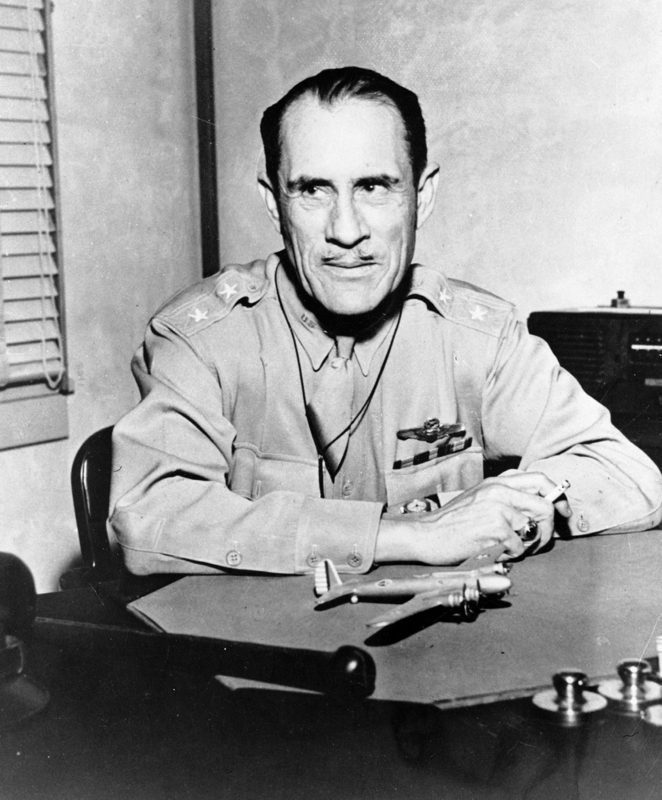 John Woolery, "Major General Clarence L. Tinker," The Chronicles of Oklahoma 27 (Fall 1949). Jon D. May, "Tinker, Clarence Leonard," The Encyclopedia of Oklahoma History and Culture, https://www.okhistory.org/publications/enc/entry.php?entry=TI005.